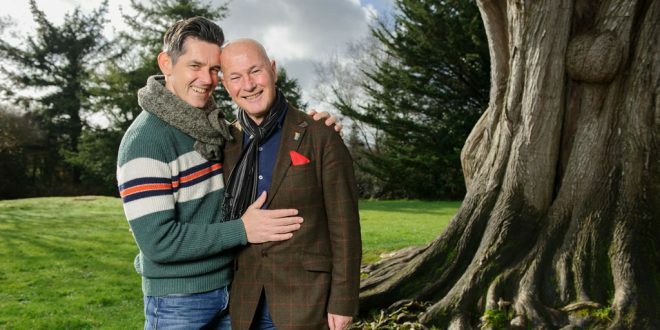 Billy Desmond and Bernárd Lynch who were married last week. Photograph by John Kelly. A new charity is to be established that aims to cater for the specific requirements of the Lesbian Gay Bisexual and Transgender (LGBT) community in rural parts of the county. Bronntanas will be steered by newly-married couple Fr Bernárd Lynch and Billy Desmond. They primarily live near Spanish Point and feel that the charity could help people to deal with their sexuality in an inclusive manner. “We’re starting up the charity to further the mental health needs of LGBT people, especially younger people. We want to help them to come to terms with who they are and how to deal with it. That is our goal,” Bernárd Lynch confirmed. The couple had asked their approximate 120 guests at their wedding, which was held at the Armada Hotel on Friday last, not to give them presents but to contribute to the charity. “We said if guests wanted to contribute voluntarily to this, they could. It’s for rural Clare. We’ll probably have to go to Ennis to have an office but it’s for people in rural communities who have no one. We’re spending most of our time here in West Clare. We both still have work in London, so we have to go back and forth. Billy hopes to increase his psychotherapist practice here. I still do some psychotherapy work, although very little. I do a lot of voluntary work. I have just resigned as chair of the London Irish LGBT forum,” Bernárd explained. The couple have found that they have been completely accepted by their neighbours and now friends, in West Clare. “The people around here were all at our wedding. We live between Spanish Point and Lahinch. They are very accepting people. Billy and I have been coming here for more than 20 years and we made no secret whatsoever of who we are. We’ve had nothing but kindness,” Bernárd noted.